How To Plan A Sweet 16 Party On A Budget? So, your youngster is now 16. You’ve done a nice job. I’m happy for you. But this can be his last birthday before he leaves for college. So, these are his last days at home. This birthday must be remarkable because any other birthday after 16 could be done at the campus, and you won’t be there. So, take your time and make the latter unforgettable for your child. And for you to plan a sweet 16 Birthday Party on a budget can be challenging. But this article is helpful. It makes the planning processes clear, easy, and exciting. Having a party without a budget can bruise your bank account. Ensure you know how much the party requires. Cut out the budget by implementing cheap, sweet ideas. Plan the budget with your child. Don’t do it alone. Give him the power and free will to choose. And you should discuss with the latter how much you can afford from what he has chosen. Enforce boundaries on everything that the birthday party needs as your budget depends on the guest list. It shows the number of guests that are likely to be present. As a result, you should compile a guest list if you haven’t. And remember, the more the guests, the more the party will cost. At first, set an imaginary number of people you can cater for, and let your kid fill the latter with friends. Doing so will save up money. 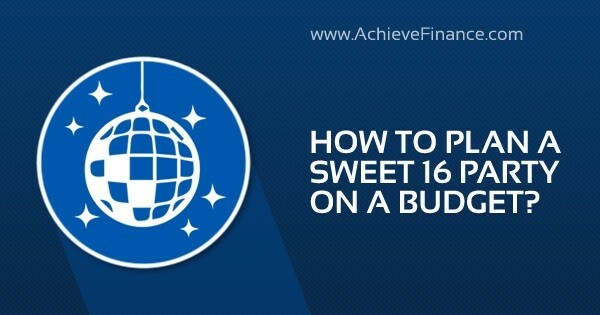 How Much Money Costs A Sweet 16 Party? Where, GC is the Guest Cost, and NGC is the Non-Guest Cost. The money to be spent on getting foods, snacks, and drinks for the guest is called the guest cost and the just mentioned can be calculated by using the formula below. NAL = Number of attendees or invitees on your list. CP = Cost of catering per person or invitee. While the non-guest cost is the amount of money that will cater for other expenses apart from the guest cost. It can be obtained by using the formula below. RC = Cost of the rents (chairs, tables, plates, spoons, speakers, iPod, and the likes). BcC = Cost of making or buying a birthday cake. GC = Cost of buying games like chess, scrabble, videos games, and the likes. EC = Cost of entertainment, DJ, and related entertaining rants. To give you an idea of how to use those formulas, permit me to cite an example. If the cost to get food, snacks, and drinks for a single person invited to his sweet 16’s party is $20 and you have 30 attendees on the guest list, you will have. And let us say the venue costs $100, the rentals cost $120, the birthday cake costs $65, the costs to hire a DJ is $150, and other things cost $10. You can reduce the budget by hosting a house party instead of renting a restaurant or a party space. Where can you get the money for the party even if you don’t have? You know how much money you want to spend and how you will spend it, but how can you get the money? Where can you get the money from? If you can’t get the money from your savings, you don’t have to disappoint your child. You can take out a personal loan online. Without leaving the comfort of your bedroom, you can get a loan approved for the party. You can make your child and his peers experience a memorable party with the ideas highlighted as we proceed. Set a Perfect Time and Location for the Party: Choosing a time for the party can be daunting if your child’s date falls on a working day. So, the perfect time to have a birthday party on a working day is the PM Hours. Ensure your child notifies all his friends of the party’s time before the day. As you prepare for the birthday, get a location and book the venue. Perhaps you want to run the party on a low budget and in that case you can consider using your home. Book a Catering Service: Perhaps you want to have a very large sweet 16 party; you should book a catering service. And if you can cook for the expected guests, then cook. Prepare the food ahead of the party’s time. Write the Party’s Timeline: Just like an order of the program. Make up a timeline for the party. It should show how the party will go. From prayers to music, to movies, to serving foods and drinks, to cutting a cake, and most importantly to the party’s end. Playing Games: Games like chess, monopoly, and scrabble can be used to spice up a sweet 16 party. Teenagers like playing video games these days. You can create a time space for them to play video soccer games, GTA, Road Rash, Super Mario, or any other interesting game. Make them tell stories: Everyone has a powerful story. Your child’s birthday can be a place to tell those stories. That is what makes the day unforgettable. Music and Dancing Performance: The right person to choose the music playlist is your child. He knows what his peers dance to. We’re done. You are free. Proceed with the preparation. Make the party awesome, memorable, and remarkable. It may be your child last birthday at home. He will leave for college soon, remember! How to Plan a Dinner Party on a Budget? How to Plan a 60th Birthday Party on a Budget? How To Plan A Cocktail Party On A Budget? How To Plan A 21st Birthday Party On A Budget? How To Decorate A Studio Apartment On A Budget? How to Build an Outdoor Kitchen on a Budget? How To Remodel A Kitchen On A Budget? How To Organize a Garage On a Tight Budget? How to Plan a Wedding on a Small Budget? How To Plan a Vacation On a Budget?